Patek Philippe, the eponymous luxury Swiss watch, or should I say, timepiece brand is known for running the same advertising campaign for years. 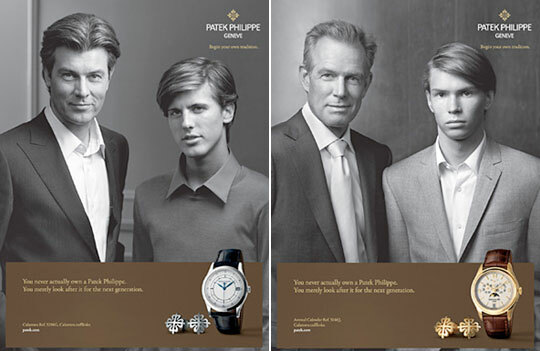 Although the images may have changed, the tagline “You never actually own a Patek Philippe. You merely look after it for the next generation.” has remained consistent, usually along with a jaw droppingly handsome and immaculately dressed and coiffured ‘father and son’ portrait. For the target market, the aristocracy and the wealthy of the world, and those that aspire to the class, the ads say many things, including ‘buy one and you’ll be like us and ‘You have class and you know class’. 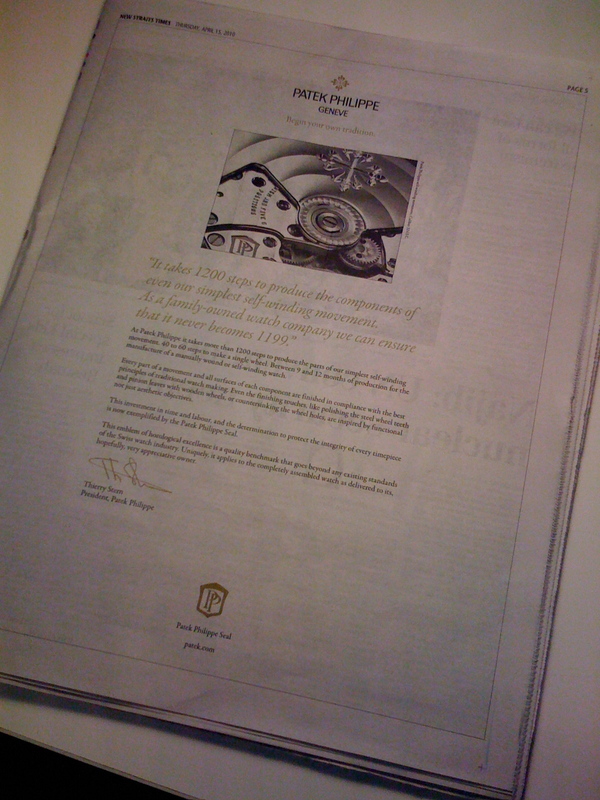 The ads are a wonderful example of luxury branding – a great product manufactured with precision engineering, immaculate heritage, an aristocratic client base and creative genius in the advertising that communicates on a level that the target market will connect with and explains, in the limited time available to garner interest, the timeless character of the brand. And I am sure the quality of service at the point of sale will be equally as impressive. PP has recently launched a new global print advertising campaign that focusses on the values of the company established by two Polish immigrants, Frantisek Czapek and Antoni Patek in Geneva in 1839. I’m not sure if this campaign is to replace the old one. I for one hope not. The latest campaign revolves around the personal letter concept and has the current president, Thierry Stern waxing lyrical about the steps involved, the time taken and care and attention to detail invested in the production of a PP timepiece. He talks about ‘polishing steel wheel teeth and pinion leaves with wooden leaves and countersinking wheel holes’ and the fact that these efforts are ‘inspired by functional not just aesthetic objectives’. He goes on to mention the Patek Philippe Seal, an ’emblem of horological excellence’ that appears to be an internal ‘quality benchmark’ that claims to be ‘beyond existing standards of the Swiss watch industry’. The ads are set to appear in ‘quality daily newspapers and influential trade publications’ around the world and will also appear at the point of sale. The first ad (I think) appeared in Malaysia in the New Straits Times on 15th April 2010. I can understand (although I don’t agree with the tactic) the mass market approach of running an ad in the New York Times or the London Times, South China Morning Post etc or any other developed country where there is significant market potential. But I can’t understand the purpose of running the ad in a developing country such as Malaysia. A quick search of the net finds a rather old PWC report, that states ‘the mean monthly gross income per Malaysian household increased from MYR2,472 in 1999 to MYR3,011 in 2002, denoting average growth of 6.8% per annum’. So if we use that growth rate to bring us up to 2010, the mean monthly gross income per Malaysian household is now roughly RM5,096 or US$1,358. Don’t forget that is gross and does not take into account the impact of the economic crisis. Another search of the Internet would suggest that the cheapest PP watch is around US$4,000 and the most expensive sold some time ago for about US$11,000,000 (that’s RM36 million in real money). The majority of PP watches appear to be in the US$10,000 to US$35,000. At those rates, the potential market in a country the size of Malaysia is tiny and an ad for such a luxury product in a daily newspaper is essentially a waste of money. Just to put things into context, the ad after the PP ad is for Honda and the ad after that is for Panasonic household appliances such as an Alkoline ionizer, hair styler and hair dryer and men’s shaver (inner Blade and outer foil). So what should PP do in developing markets like Malaysia? 1) Rethink the one-size-fits-all mass market approach to building a brand, especially in developing markets. The consumers who can afford your products can be engaged much more effectively in other ways. 2) Build a database of prospects and customers. But all markets require different strategies and data collection techniques will be different. 3) Build relationships with your existing customers. Existing customers are often ignored by companies scared of asking too many probing questions. And certainly timing is important. But well trained luxury retail staff can build relationships with wealthy customers who are likely to be successful businessmen and politicians and their opinions will carry a lot of weight with prospective customers. 4) Advertising is important, but choose your channels carefully. Mass circulation newspapers and magazines are for shavers and hypermarkets. 5) Content is important too. I’m not sure anyone really cares what is hidden away inside the shell of a product with almost 200 years of heritage. After all, if the quality was a given in the previous campaign, why must it be addressed now? 6) Integrate your digital commuications with mobile channels to engage with prospects and customers interactively when they are on the move. Building a brand is hard enough. PP has done it successfully for 200 years. But treating every market the same and using mass marketing tactics that belong to an era that no longer exists, will make it hard to do it successfully for the next 200 years.